Those of you who read my blog regularly know that I'm no shoppingholic. Yet, lately I've been doing some local shopping (by local I mean all Croatian brands) and it was an enjoyable experience. One of my purchases was this fabulous denim skirt. I already gave up on finding the perfect denim skirt when I found this beauty in Amadeus. I paired it with a DIY chocker, plain black top and boromira sandals. 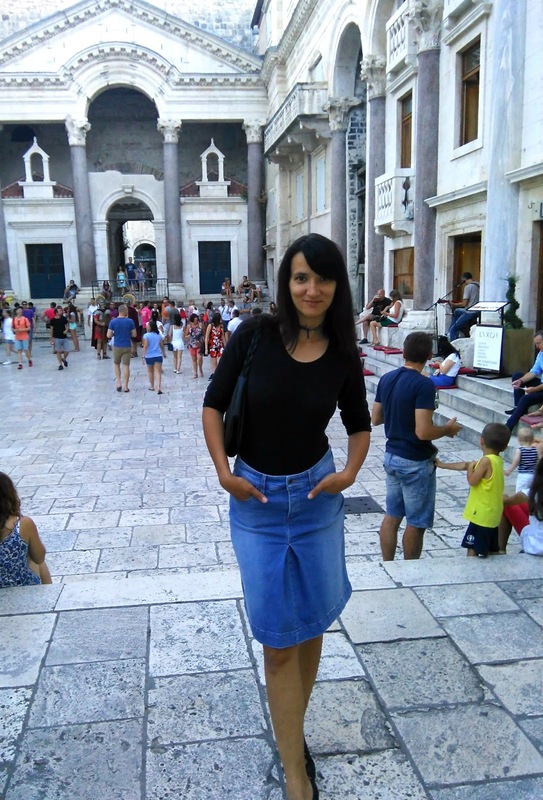 I wore this outfit for a walk around town which ended up with a having a meal in restaurant Dujin dvor ( LINK). The dinner was great (albeit with modest portions), so I'm taking this opportunity to recommend this restaurant (you can see it in the last photograph...and speaking of which, some photographs were taken with camera and some with our cellphones so the quality varies, sorry for that but my scoliosis has been bothering me and dragging my cam everywhere with me becomes increasingly difficult). Anyway, I felt very comfortable wearing this. This outfit makes me think of the nineties and summers in the city. Why should nineties associate me with an urban environment, I'm not sure. 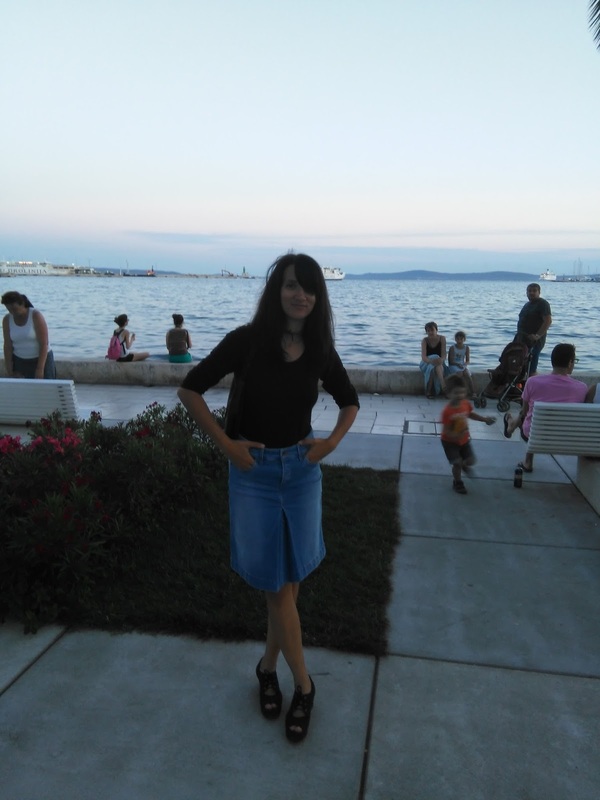 Truth be told, when I was younger I never used to spend my Summers in Split. As soon as school was over, we would head to island Hvar. 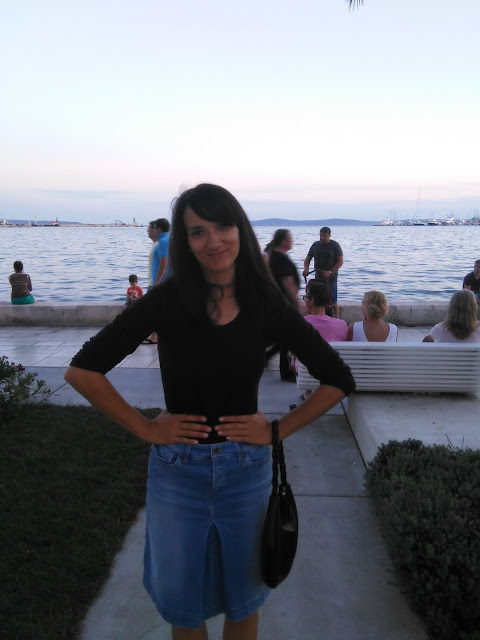 Only when I graduated high school and started working did I end up spending Summer in Split. 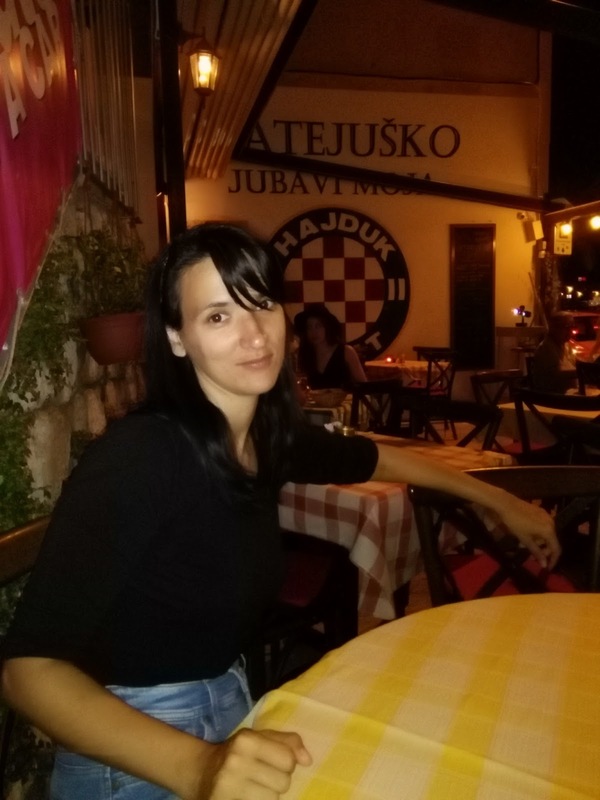 As much as I love Hvar (and I love it insanely much), I must admit that I also like to spend Summers in an urban jungle (be it Split or Mostar). In Summer, cities are different. They are somewhat sleepy and kind of empty. The vibe is completely different. Everyone is on vacation....and it feels kind of nice being there by yourself...you feel like that kid in Home Alone. Sometimes it is nice to be by ourselves. Even in Summer. Summer in a city. I know what you're thinking...Are you crazy? The heat!!! Well, you gotta be sneaky. Get up at 6 am and go swimming at Znjan beach at 7 am because that is when there isn't anyone there so you practically the beach to yourself. Walk your neighbour's dog at 2 am (ok, that was a memory from another lifetime, my neighbour's dog, the one I always took for a walk has passed away after a long and happy life. I'm sure Medo is enjoying dog paradise right now and it is nice to remember him. Because it was awesome taking him on those long walks at crazy hours.I miss you Medo). Back to topic of heat and urban living. Stay close to greenery, for walks choose parks or streets that have plenty of shade or any kind of trees. Green helps. If your city has a lake, a river or even a creek, make the most of it. Water makes us feel more relax! Moreover, Summer is a great time to reconnect with water fairies and breathe that ozon in. If the city you live in has sea, you know what you must do. Beach time, big time!!! However, don't limit yourself to trendy beaches, find some place that will be special to you. Don't expose yourself to sun between 10 and 5 o'clock. Not because it is not healthy but because it is just insane. Take care! Drink plenty of water. Following some basic logic, you should be able to enjoy Summer even if you can't go on vacation (for what ever reason) and you end up city bound. Trust me. Spending a Summer in a city can actually be pretty cool and feel damn good. It is all in our heads. I'd been curious about your new denim skirt ever since you mentioned it to me. Yes it fabulous and also fabulous that you were able to support a local business with your purchase. A denim skirt has so many styling possibilities. I like how you went simple with this outfit and I look forward too seeing the other ways you'll be wearing it. I wish NYC would be quiet during the summer. It seems like even more people are about and tourism surges for the season. yes, a good denim skirt goes a long way. I'm happy you like this one. thank you dear. Yes, having a full time job can make every season look alike. Denim skirt can be tricky to find the right fit and you look great with your purchase. I lived in an urban jungle for almost 18 years and frankly I was tired of it after 5 years and don't think I can live in a city ever again. Hi there, Ivana! How you doing? Hope everything is going right, actually I answered your comment on my blog and I really appreciate every single comment you shared on my site, you're such an inspiration and push me beyond to create and create :D So thanks for that! Hope you have an awesome Tuesday, dear friend and regards from Barcelona. Look so different and even fresh this time! Maybe because of a black top?? or bangs?? probably because of the bangs...and I don't wear black often, so that might be the reason too. thank you Shamu:) I know you're no fan of the heat, I cope with it well most of the time but sometimes it tires me. thank you Shirley, I can understand that. Beutiful photos! And very nice skirt! What a charming girl you are! You have wonderful taste in clothes, Ivana! I like your local Croatian brands. The clothes look very stylish! Sai che anche io amo stare in città in estate? Anche Roma è diversissima in questo periodo, fa caldo ma tutto sommato è molto più vivibile, soprattutto perchè non c'è tutto il traffico che c'è normalmente e si può andare facilmente da un posto all'altro! grazie Silvia....devo visitare Roma in questo periodo! Preslatka si u ovom outfitu! Ova suknja ti stoji za 5! 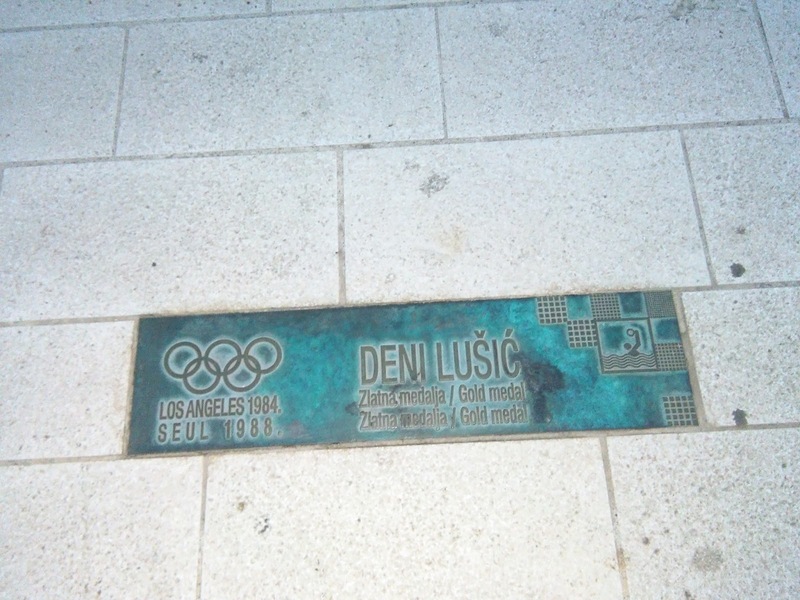 :) U Dujinom dvoru jos nisam bila ali se nadam da nekad uskoro, kad opet budem u HR hocu. Loving your skirt!! Denim skirts are so in right now! vrijeme je stvarno ludo...danas smo u Mostaru imali pravu oluju. I really like your denim skirt and I am glad you found one you liked (Amadeus is a great name for a shop!) . I have always lived in Suburbia, it is nice to get away to somewhere nearer to the countryside or sea!! I've not really spent loads of time in cities! Great photos dear, you look so happy and relaxed on all of them :-) Such nice places too! thank you, I love my hometown. 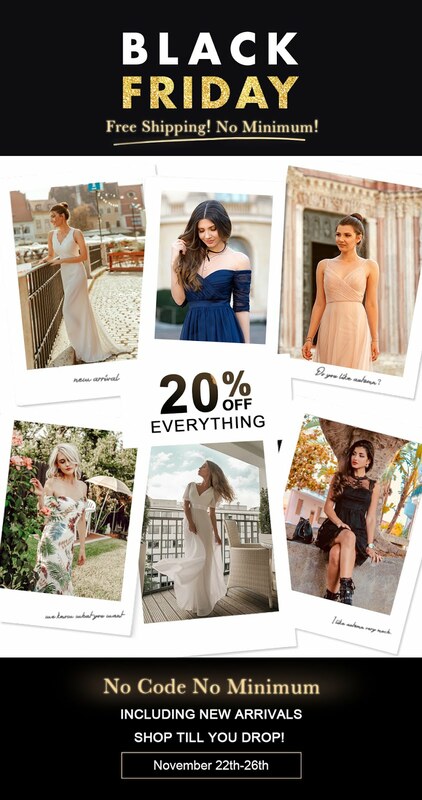 Bellissime foto marine e look estivo!!! Wow!! 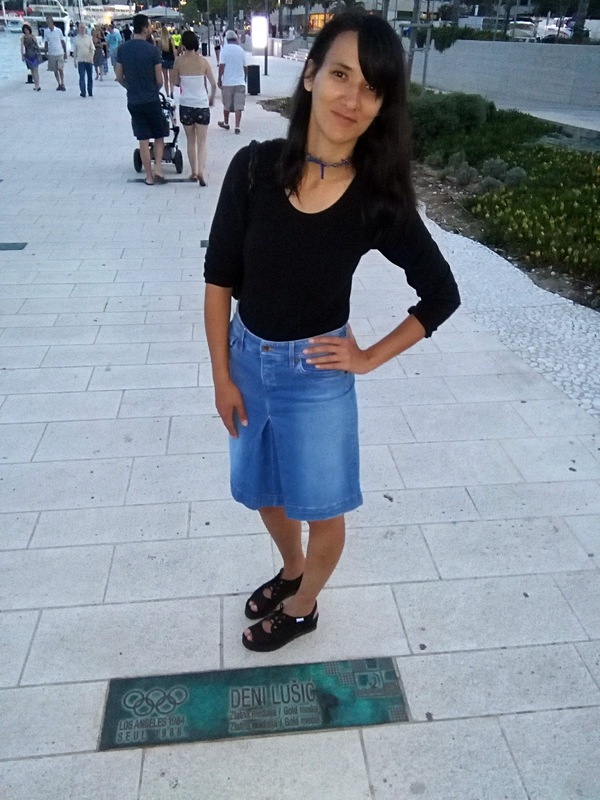 Absolutely love the pictures Ivana, and I love your skirt <3 you look gorgeous! 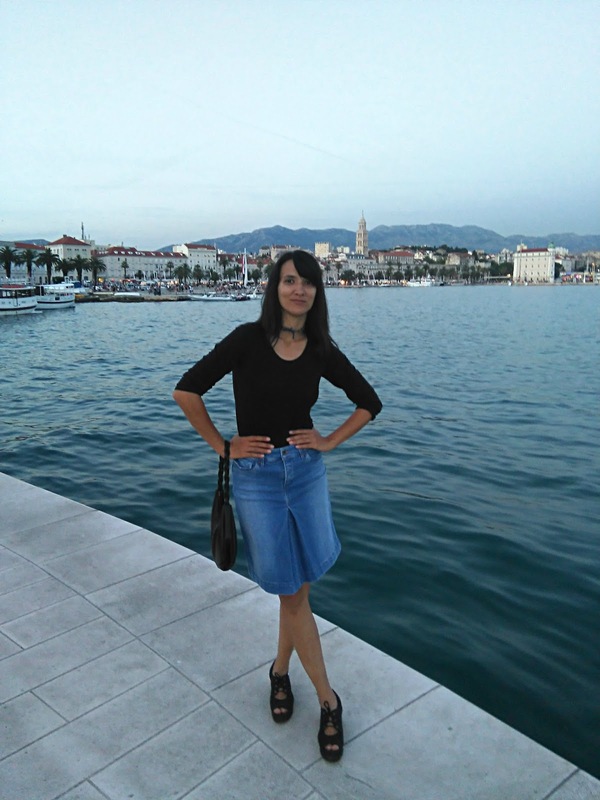 You look great in this denim skirt, dearest Ivana, and it's wonderful that you prefer to buy your cloths from Croatian brands! It was nice to accompany you to the harbor with its ships and a little taste of sea air! Not so fine to read that you have problems with your scoliosis - I wish you that it will become better soon! Hugs and I hope you enjoy the summer! 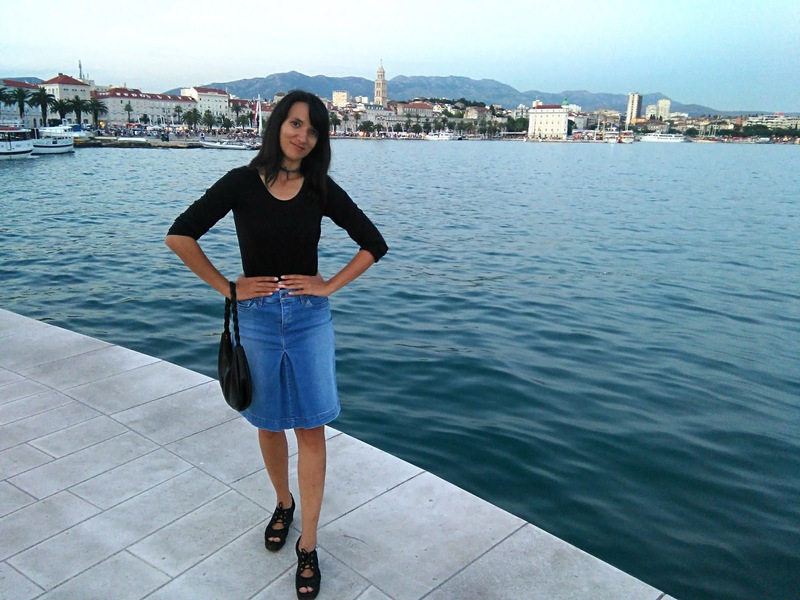 Dear Ivana, yes your denim skirt from that Croatian brand is perfect! And I really see the 90s vibes of your look! Thanks for sharing your memories and thoughts again ... there are also in my life some vibes I feel in the different season. E. g. summer when it is really hot reminds me on my childhood in that small Bavarian country, with the smell of hay and hot tar. This summer is not that hot and we had only a few such days. How wonderful you finished your perfect day with such a good meal. Thanks for sharing all the pictures and have a happy weekend! thank you dear Rena. Summer makes me often think of childhood...why Summer and not some other season, I'm not sure! Perhaps because kids love Summer. Lepa dama i bez trunke sminke u nonsalantnoj letnjoj kombinaciji!